This morning, Anne woke up clutching this little foldout pamphlet with all 20 mysteries of the rosary printed on it that she had picked up after Mass yesterday. For each mystery, there is a tiny, color illustration, which is what I think captured her imagination the most. "I'm ready, Mommy. Don't forget my little prayer book!" She kept it with her throughout breakfast, then asked me for rosary beads so that "we could pray in the car on the way to school." I was absolutely delighted, but then remembered that I wasn't driving her to school today. "Sorry darling, we can't pray in the car today. But how about while I pack our lunches?" I fetch her a set of St. Kateri rosary beads that were hanging out in my purse, and hand them to her. "I like the blue beads, Mommy!" "Those are for the Our Fathers. We pray a Hail Mary on the other beads." "I do not want to use the other beads." "Well, that's how...OK, it doesn't matter right now. It's just good that you are holding the beads and want to pray the rosary. Let's look at your little pamphlet and you can pick one picture for us to pray about." "I get to pick one of the pictures?!" That was a real crowd-pleaser. "Yep! How about one of these on the far left? Those are the Joyful Mysteries, which we pray on Mondays." "I like the one with the angel!" "All right, now we pray an Our Father." "I don't know that one all the way yet." "I know, that's OK. I'll pray that one. You just hold one of the blue beads." "OK! I can pick whatever blue one I want, right?" "All right, now we move onto the Hail Mary, and you know that one really well. Do you want to pray those out loud for me?" "But you love praying the Hail Mary." "I know, but I want to pick a new picture now!" "Well, we we're not quite ready to move on yet, Dear..."
"Mommy, what's this one? Jesus is carrying this big cross. I want to pick that one!!" "Well, OK, Darling, but then we do have to pray the prayers." "Here, hold onto this red bead and keep track for Mommy since I have to pack our lunches." "I do not want to hold that red bead." "Well, fine, pick a different bead, but you have to keep count while Mommy packs. That IS the reason we have the beads, so that we can keep count." "I do not want to do that. I want to pick one of the blue beads again!" As you can likely surmise, we didn't get a whole lot of praying done. But any opportunity to talk to my kids about the rosary is a good thing, in my estimation. Right? We'll go with that. But what about our own prayer lives?! I wrote about taking on "Easter Resolutions" over at CatholicMom.com this month. Want to take a peek? 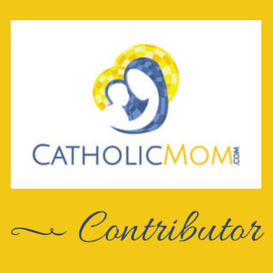 I would LOVE for you to leave a comment with your thoughts over at Catholic Mom. Just like our dear Samantha has done, HI SAMANTHA! :0 What are you spiritual resolutions this Easter season? Write in! Love reading your blog! As a new Catholic I learn something every post! My Easter resolution is to keep going with my new routine of doing the daily readings and pausing at some point during the day to thank God for bringing me this far in my faith journey. Hi Beth! So, so glad to see you on here as always, my friend! I absolutely LOVE your Easter resolution! It's the simple things, yes? And consistency, as you mention with your daily readings. Just keeping something going every single day is a major accomplishment.